​If you lead an active lifestyle that includes backpacking, hiking, camping, trekking, and walking, you may be interested in taking a look at TheFitLife Nordic Walking Trekking Poles. These poles deliver more than just the basics when it comes to outdoor adventures. The price is affordable, and the quality is superior to some of the standard walking sticks available today. TheFitLife​ products tend to be sturdy and these poles continue the tradition offering stability and support for your weight when you need to take a break. If you want to learn more, just keep reading this review to get the information you need to make an informed purchase. 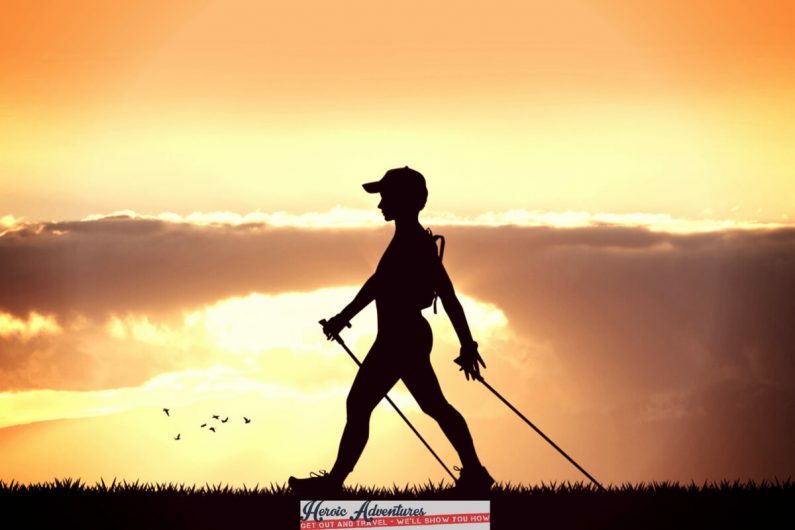 ​TheFitLife Nordic Walking Trekking Poles deliver the level of strength and stability required by individuals of greater than average height and weight. The adjustability of the poles enables their use by individuals of smaller girth and height. These lightweight poles are good for hikers at different skill levels. Embracing a modern trend in styling, the manufacturer of this set offers it in five colors, providing attractive options for both men and women. Users who prefer help in using their hiking poles will appreciate this pair. It includes a measuring scale and a stop mark to assist them in figuring out accurate positioning. ​With your purchase of TheFitLife Nordic Walking Trekking Poles, you receive a few essentials for your adventures. In addition to a pair of poles, you get a free carry bag, which is just the right size to transport or store your poles. Each pole has adjustable wrist straps, a quick lock system, the EVA foam handle, and a rubber grip. TheFitLife Nordic Walking Trekking Poles offer many beneficial features that most hikers can appreciate. The poles are noise absorbent, creating a quieter trek than many other models. These walking sticks are easy to collapse and store in a backpack or carry bag when they aren't actively being used. TheFitLife Nordic Walking Trekking Poles come with extra-long EVA handles with wrist straps that prevent unwanted slipping. EVA grips are known to absorb moisture and reduce chafing, while being comfortable to hold. This ultralight pair of trekking poles is also shock absorbent, a feature that protects your knees and minimizes the possibility of joint damage caused by hard impacts. It is important to reduce the force on your knees, even if you aren't having any issues with them currently. Each pair of poles is corrosion resistant and capable of bearing up to 440 lbs. It is possible to collapse the poles as short as 26 inches or extend them to a length of 53 inches. Each telescoping pole is labeled with the word "stop" to indicate the maximum extension. Once the quick locks are securely twisted into place, the poles offer a sturdy aid for trekking on rugged terrain. It's easy to customize your look, because TheFitLife Nordic Walking Trekking Poles are sold in several colors, including black, blue, red, silver, and purple. A 100% money back guarantee is in effect during the initial 180 days. All you need to do is use your poles during that time to ensure you are happy with them. ​The instructions on how to use your new trekking poles are simple and to the point. ​Take your trekking poles out of the packaging. Grasp one pole by the handle and hold it vertically from the ground up toward your shoulder. Extend the pole by pulling the bottom part of it all of the way out to the "stop" mark. Twist the bottom to tighten the pole. Now you are ready to pull and set the middle section at a length that you feel is suitable for your height. Tighten your setting securely and insert the correct tips for the terrain you intend to travel. ​TheFitLife Nordic Walking Trekking Poles offer a reliable and sturdy option for serious walkers and hikers. However, it is possible that you may want a product that is fitted to your personal measurements. ​When this is the case, you may want to look into a set of American Nordic Walking System Real Nordic Walking Poles. They come highly recommended as a reliable solution for individuals undergoing physical therapy. Each set of poles is tailored for a specific individual in order to create a custom product. The price is higher than a pre-made set of poles. On the upside, you never need to worry about setting the height of your poles, because this step has already been accomplished for you. ​Whether you are climbing uphill or hiking up a slight include, you need a pair of reliable trekking poles to minimize the impact to your knees and joints. You may also want to maintain your balance, enhance your stability, and improve your average walking time. TheFitLife Nordic Walking Trekking Poles can deliver on each of those goals. Not only do they offer anti-shock capabilities, but they also skid resistant. If you enjoy snow walking, mountain climbing, or hiking on rugged terrain, this pair of poles have the features needed for a safe trek.